The Temporal Mandibular Joint (TMJ) is the area in the jaw where the jaw bone meets the face bones.TMJ syndrome refers to dysfunctions of the temporal mandibular joint capsule. Temporal Mandibular Dysfunction (TMD) can cause jaw pain, sinus pain and even headaches. 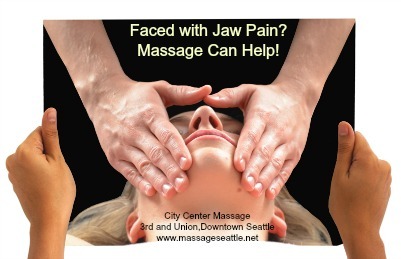 It can be helped with specific massage techniques for the jaw. TMD refers to temporal mandibular dysfunction which includes other conditions involving the jaw structure and the muscular system such as occlusal interferences, muscular disorders, neurological disorders and biochemical imbalances. Other terms for this condition include myofascial pain and dysfunction, craniomandibular dysfunction, and masticatory muscle pain. The TMJ is formed by the temporal and mandibular bones. Attached to the mandibular condyle is a fibrocartilage meniscus or articular disk, which allows the mandible to move smoothly. The masticatory muscles (temporalis, masseter, lateral pterygoid, and medial pterygoid) are responsible for movement and stabilization of the TMJ. The masseter is the most powerful jaw closure muscle. It is also the muscle most capable of limiting jaw opening. Due to stress, people often develop bruxism. Bruxism is a pathological clenching and grinding of teeth that usually occurs during sleep. Bruxism is caused by the hyperactive contraction of the masticatory (jaw )muscles. Imagine any other muscles in our support and movement system kept under tight contraction for seven hours. Pathological hypertonus in these muscles will be formed, followed by restriction of range of motion, trigger point development, and other symptoms. With time, hypertonic condition in the masticatory muscles leads to the development of osteoarthritis in the TMJ, including negative effects on the articular meniscus. In such a case, the above-mentioned TMJ pathology starts producing severe headaches and painful "clicks." Jaw clenching during the day can be an extension of bruxism and stress. TMJ or Temporal Mandibular Joint conditions and dysfunction requires a multi-faceted approach. Dentists can fit you with night guards most of which can treat the symptoms of jaw problems but not the underlying reason why there is a problem. The causes of TMJ are many and the treatments vary. TMJ is usually related to high levels of stress, neck and back tension as well as muscle tightness due to food allergies or improper diets of high carbs and sugar. TMJ is often just a symptom of a deeper underlying issue usually related to stress. Stress is also a big part of TMJ pain and using massage to help reduce stress and get you more in touch with what you are feeling and more in the present moment. Stress can be caused by a number of factors. Physiological stress might be imposed by problems such as gallstones, kidney dysfunction or arteriosclerotic heart disease. Stress also can be induced by poor posture secondary to a shortened leg, for example. Psychoemotional stress, yet another category, is due to life frustrations, neuroses, or harbored destructive emotions like chronic anger. Environmental conditions - breathing polluted air or working in a noisy environment - produce stress as well. From a massage therapists perspective, I look at the overall alignment of the body. Scoliosis is notorious for adding to TMJ and TD symptoms because the misalignment of the body puts more pressure on one side of the jaw. There are other therapists that actually have extra training in intra-oral massage techniques to help this from inside the mouth. Currently, I do not have this extra licensing requirement although I am aware of the techniques from previous training.